These Trademark Usage Guidelines (these " Guidelines ") apply to your use, in a manner that has been approved in advance by Amazon, of the following logo (the " Amazon Mark ") available on the page below. As used in these Guidelines, the term "we," "us" or "Amazon" means Amazon Services LLC, Amazon EU S.à.R.L., or any of its affiliate companies, as the case may be, and "you" means the person or entity using the Amazon Mark. Strict compliance with these Guidelines is required at all times, and any use of the Amazon Mark in violation of these Guidelines will automatically terminate any licence related to your use of the Amazon Mark. YOU ARE ONLY ALLOWED TO USE THE AMAZON MARK TO ADVERTISE THE AVAILABILITY OF YOUR PRODUCTS ON AN AMAZON SITE. YOU MAY USE THE AMAZON MARK (a) ON YOUR OWN WEBSITE, (b) IN ONLINE ADVERTISEMENTS AND/OR (c) IN OFFLINE ADVERTISEMENTS. You may use the Amazon Mark solely for the purpose expressly authorised by Amazon in these Guidelines and your use must: (i) comply with the most up-to-date version of these Guidelines; and (ii) comply with any other terms, conditions or policies that Amazon may issue from time to time that apply to the use of the Amazon Mark. Below is the approved Amazon Mark image for you to use. 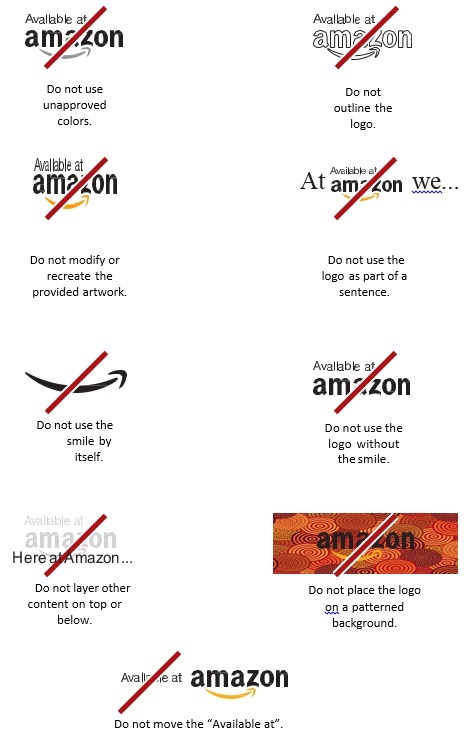 You may not alter the Amazon Mark in any manner, including, but not limited to, changing the proportion, colour or font of the Amazon Mark, or adding or removing any element(s) to or from the Amazon Mark. You may not use the Amazon Mark in any manner that implies sponsorship or endorsement by Amazon, other than by using the Amazon Mark as specifically authorised in these Guidelines by Amazon. The Amazon Mark must appear in its entirety, with reasonable spacing between each side of the Amazon Mark and other visual, graphic or textual elements. Under no circumstance should the Amazon Mark be placed on any background that interferes with the readability or display of the Amazon Mark. Product images should not include any badges used on Amazon.com, or variations, modifications or anything confusingly similar to such badges. This includes, but is not limited to, "Amazon's Choice," "Premium Choice," "Amazon Alexa," "Works with Amazon Alexa," "Best Seller," or "Top Seller." You may include the following statement in and on any materials that display the Amazon Mark (written or electronic): "Amazon's trademark is used under licence from Amazon.com, Inc. or its affiliates." Amazon reserves the right, exercisable at its sole discretion, to modify these Guidelines and/or the approved Amazon Mark at any time, and to take appropriate action against any use without permission or any use that does not conform to these Guidelines. If you need to place a logo into an application, simply right-click one of the logo images below and save it to your desktop. You can size this image smaller but do not make it larger, as it will distort. If you need a larger logo for screen use, download the high-resolution JPEG instead. If you need a larger image for on-screen use, download the “JPEG-High resolution” file. This is a very large image, but it can be made smaller in your application. If you print the logo or provide it to a third party that will be printing the logo, download one of the files under "Print Use." Consult with your third-party printer about whether you need the CMYK version or the spot colour version. Note: These are all scalable in Adobe Illustrator. Do not alter the logo artwork in proportion or colour. Below are some examples of unacceptable logo presentations.